CarShipIO Team wanted to share with you some general equipment information for auto transport practitioners and people who want to start their own car hauler business. Let’s start with the basic of what’s a car hauler company? A Car Carrier or Car Hauler company can be used to transport or move your car so you can save your time, money and mileage of driving it yourself. 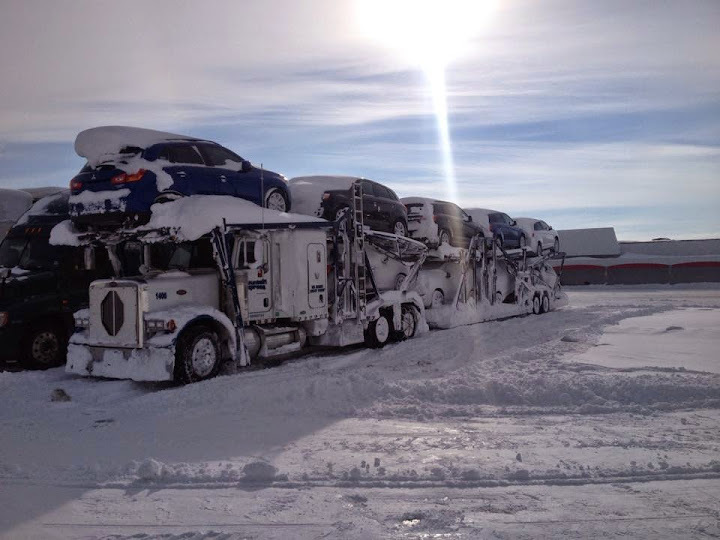 In the business of car carriers there are different types of auto transport trucks to choose from, depending on your needs, but in this article, we would speak about the 2 most common used car carrier truck types. Here we go with a quick overview of these 2 truck types for car shipping! The first one is the open carrier truck type transport, shipping with this type of truck will save you money. The car protection in the process of transportation is not in top notch security, but from experience of different companies and drivers, the damage is very rare. The final consumer of the vehicle will save money with this type of truck because he will be sharing the cost of the vehicle with other customers that are shipping at the same time at a nearby final destination. The second most common way to transport a vehicle, typically set of specific vehicles like luxurious, high-value and collectible is enclosed. The thing with these type of car carrier truck is the price. It is usually available to big budget people.a general guideline. the price can sometimes be doubled compared to open carrier truck types. A general guideline is that the price can sometimes be doubled compared to open carrier truck types. Also, the cost depends on the number of cars that will be shipped and also the expenses for the insurance on that trip. The loading system of the car carrier truck is designed to load and unload the vehicles easier than the open carrier truck. The advantage here is the highest caliber of security for the cars from climate change, road impacts, or any different types of physical impacts. Every type has pros and cons, it always depends on what are your needs when you transports your cars. Tractor-trailer trucks or multi-car trailers are a type of open transport. They represent a better choice for discount auto shipping because. Why? Bigger Quantity – they can haul more vehicles at once over more miles. Slower Speed – They have the disadvantage that they are slower and have a hard time navigating in different residential areas. In this specific case, when you will a have a tractor-trailer truck, meeting the driver in an open parking lot to load and unload the car from a tractor trailer, or using a terminal-to-terminal auto shipping parking will be the best solutions. They are a preferred method for shipping SUV’s, trucks, and modified cars. Thank you for your read, hope that this general guideline will help you understand better the equipment for this kind of business. Please feel free to ask CarShipIO questions about what you need for your car hauler business. We have been facing a paradox problem that we would like to address and explain. Most of the business owners, whether they are the truck drivers themselves or are the managers of drivers, face the same issue of having “no time”. They are always busy. This cycle never ends, at first they are looking for job, then it’s a back and forth communication with the customer, price estimates, and quotes, sorting the cars on the truck, notify customer when picked up, delivered, stuck on a road, etc etc… just never ends, and no time to expand the business nor relax. CarShipIO Car Carrier Software has a solution. We have created a one stop do it all software that it designed specifically for auto haulers. We help you give correct estimates, in an instant see which job is profitable, or pays more. With just a click of a button, you can update the status of your jobs, so that all of the parties can be aware where the vehicle is at. No more phone calls to brokers, dispatchers, and customers!!! Right here you can also create a custom invoice and BOL and either email it, fax it or print it for your customers. There is no more need to scribble on a paper the damages/scratches to a car, the driver can take/upload pictures with his phone and either save them into the system or email to the customer or broker right away! CarShipIO knows your problems and has easy solutions. But in order for an automated process to work it’s best, you have to make a little commitment and enter your info, that you enter anyway, but in a more accustomed way. Once you enter all of the info, such as your truck details, customer’s info, broker’s info, insurance etc. CarShipIO car carrier software will automatically remind you about maintenance that needs to be done on a truck, it can calculate the profitability of your run based on the gas usage of your truck, knowing your customers, it can send them invoices and BOLs, and status updates with your command. With just a little commitment you can create a big helper for yourself that will save you a lot of time or create you time to expand your business. Initially, it is very difficult to start, find this time especially during a busy season, but it is an investment – investment in your future, in the future of your own business. Having all of the documents, receipts, invoices, notes, customers, trucks in one place gets you ready for the tax season, saving you a ton of time of looking for all of the info for the past year, it gets you ready for audits, and simply with just a few clicks summarizes your business for your own knowledge. You can know profitability by a driver, a customer, a trip. You can easily eliminate extra expenses such as maintenance when it was very predictable. Please do yourself a favor and invest your time today for the easier future! We are always here to help, our advanced technical team can set up an individual time with you to help you get started using our software for car carriers and answer any technical questions you may have, so keep this number handy: 267-270-2248, we are here to help you getting to where you really want to be. We all know that time is valuable, and if you are spending time less efficiently than your competition you are losing your money and need to look at your car hauler business process for possible inefficiencies and address them immediately. The more time you can free up, the more you can invest that time into growing your car carrier business and keep your customers happy. Let’s look at some inefficiencies and some solutions in your Auto Transport Business. How do you invoice your clients? If it takes you more than a minute, you are probably spinning your wheels going from one application to another or writing invoices by hand. The solution to is to store all your load information in a software that also lets you invoice clients with just a few clicks, so it takes less than 10 seconds to generate and send out the invoice. If you can free up 3hrs per week, you can do something more productive like work on finding quality loads or spend time working on your marketing, that time can translate to thousands of dollars each week just by invoicing faster. I hope you see how you can get a nice Return on Investment by switching to an application that manages your loads in one place just for the sake of saving time on invoicing. Another added benefit for a car carrier is getting PAID FASTER since you can generate invoices with one click right after delivery right from your mobile device! If you are strapped for cash, this gives you the much-needed cash flow and additional ROI because you aren’t borrowing at a high-interest rate or using money factoring services. How many customers did you forget to invoice or did not collect payment because it slipped through the cracks? Payments not collected may cost your business thousands a month. What if that no longer was an issue? Some applications track late invoices as well as loads that you need to invoice, this will ensure you don’t miss a payment. How do you plan your trips today? You have 10 pickups and 10 drop offs and all you have is print outs or files in your cloud storage. Planning your trip is not an easy task and you may use several applications such as online maps or GPS and you spend 1hr or more. Some just outsource it all together and pay as much as 25% or more for this service. It doesn’t have to be this way, some applications save time by combining all your loads on one map in a trip planner, a map view using your loads pickup and delivery address. Once you plan your trip, the details are instantly synced up and your drivers can see the trip and load details on their mobile interface. When everyone is collaborating in real time, any updates in trip details and the pickup/delivery information is as easy as making a change to the data. Now count how much time of your day gets drained on the phone or emails with your drivers just dealing with dispatch before or after they start their trips… Ok, say it’s on average 2 min per load, multiply that times loads per week… you get what we are saying? Now your drivers see the changes real time! When a customer inquires, how do you know when their vehicle will be delivered up? Do you make a phone call to your driver? Do you text them? How much time does that take? With automatic status and ETA notifications, every time you or your drivers does a pickup/delivery they can update the status on their mobile device and automatically notify your customers. Also your customers will be happy knowing they can check the status of the car shipment any time like on a UPS shipment – and that’s good customer service. So if both you and your customer see the vehicle status real time you will see a drop in call volume. Save time by generating invoices in under 30 seconds and by avoiding double entering loads into multiple places. You get paid faster because you can invoice from your truck as soon as you deliver, which saves you money and increases cash flow. You stay on top of your finances, get reminders on late or unpaid invoices, you never miss a payment again and/or forget to invoice in the first place. You plan your trips faster, your driver sees all the trip details on their mobile device instantly, updates load status real time, which cuts down on call volume from worried customers. You communicating effortlessly with your drivers, customers, dispatchers. You use extra time and money you save to grow your business. There are many other mone and time saving features an online business management tool provides to help you run your business more efficiently. CarShipIO is such a tool designed exclusively for your Auto Transport business. Our car carrier software and auto hauler software saves you time, money Sign up for our service today – we would love to hear how you are saving time and money once you become our customer. Managing loads is the essence of your business. That’s why CarShipIO Car Hauler Software gives you the online tools you need to make your job easier, more efficient and faster by eliminating truckloads of scribbles, spreadsheets and faxes. With Carshipio, you can stop pushing paper and start pushing your business forward. Say you are a truck owner and you just dropped off your cars on a Friday afternoon. If you are still billing your customers the old way, you’ll probably wait until Monday to generate a new invoice from scratch, print it, fax it and hope the customer will receive it. If he doesn’t, you’ll have to resend the invoice again and make lots of phone calls to double-check if it had arrived. And let’s face it, chasing after your invoices take time. In fact, you might find yourself working overtime just to keep up. And that’s time away from growing your business – and your family. When you use CarShip IO Auto Transport Platform, billing your customers becomes a walk in the park. Just drop off those new shiny cars (or beat up clunkers) and with a few swipes on your mobile app, you can mark the load as Delivered and send that invoice right from your truck, together with any other important documents, like your BOL. And you don’t need to enter your customer’s information. It’s all at your fingertips. So now you can get back home and enjoy that weekend. And there is lots more. With CarShipIO you can track your entire business with just one click. See the status of all your trucks and know where they are within seconds. Track your jobs from “quote” to “complete” and build schedules and plan out routes in a new, more efficient way. You can even make accurate job estimates or track your expenses and get important reminders. So what are you waiting for? We can help you get out of the rut and get you moving a whole lot faster. Register with CarshipIO Digital Office today. It will make you, your customers – and even your dog – very happy. Best of all, your first month is FREE, and comes with a no hassle 90 Day Money Back Guarantee.